Last post we discussed the importance of aligning your digital strategy with your business strategy to increase its impact and chances for success. In today’s post, we’ll focus on starting with your customer and leveraging digital to create amazing customer journeys. Amazon, Apple, Uber and Zappos are consumer-oriented digital leaders that have set the bar very high for the rest of us regarding what digital experiences should look like. Apps and customer interactions are amazingly intuitive, targeted, quick and simple—they just work! No friction and if a wrinkle appears, the human channel support is just as frictionless as the digital one. Digital natives and many of the rest of us are now tethered to our mobile phones and expect to be able to use it for all but the most complex situations. Responsive apps that are optimized for the mobile experience, minimize what I have to type, anticipate what I’ll want to do and connect with my social networks and other apps is what I expect. Unless of course, I’d prefer to use my laptop or call someone—but let me choose. This easy customer experience expectation now extends to B2B interactions and covers the full lifecycle from prospect to sale to service, and even to the process of severing a relationship with a company. A customer may use social media to rant about their service disconnection process, or decide not to switch back at a future date, because of the last bad experience they had with a company. The customer experience goes well beyond the user interface and is impacted by the brand and all channels that could create a touchpoint for the customer, beginning with omni-channel marketing. Making this end-to-end experience great is no small task, and often starts with the products and services. Simplifying products themselves (for example, by providing a fixed set of desired options as opposed to one-off customizations) can make the work of automation around them easier. Understanding your current customer experience and your customers’ expectations should be a key driver in developing your digital strategy. Many organizations’ understanding of their customers’ expectations are outdated – unless they’ve recently done some research or have mature “voice of the customer” capabilities in place. If you don’t have a recent pulse, then doing some customer research is advised to inform the strategy process. Some organizations conduct a customer journey mapping session as a surrogate when scope or resources preclude in-depth research. 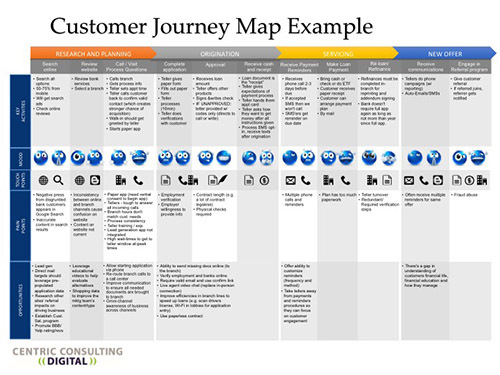 In Customer Journey Mapping, you can use your internal client-facing and servicing people to represent the voice of the customer. In the mapping sessions, the participants can step through the customer experience, recording a specific customer persona’s touchpoints, thoughts, actions, activities, emotions and “moments of truth” or decisions. Summarizing the output in an easy-to-follow format can be helpful to educate or engage others in the organization in understanding either current or envisioned future state. Or, download the image as a PDF. Truly understanding what your customers’ journeys are and focusing your digital efforts around creating easy and seamless interactions across all the customer touchpoints can go a long way toward realizing the opportunities of digital. 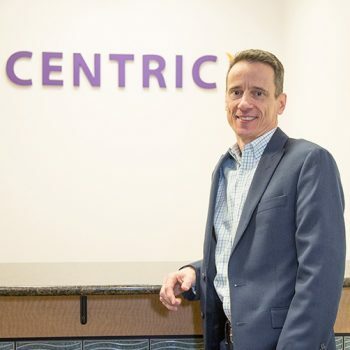 John Zink is the Digital Strategy Practice Lead for Centric Consulting, responsible for client engagements, project methodologies and practices. He is passionate about aligning Digital Strategy with the overall business objectives and helping clients deliver change by leveraging enabling digital technologies. 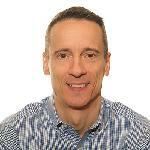 John spent 13 years with a Big 4 Consulting firm and over 15 years in IT and Financial Service operations executive leadership positions. His experience in living on both sides of the business operations and technology spectrum in organizations provides him with a unique perspective that bridges the often too-wide gap in how these stakeholders look at their businesses and digital opportunities.